The Welsh Medieval Castles are truly magnificent. The most famous Welsh Medieval Castles were built during the reign of the English Plantagenet King Edward I (r.1272-1307). King Edward of England crushed the Welsh rebellion led by Llewellyn ap Gruffudd and conquered his kingdom of Gwynedd in Northern Wales. The English King Edward employed a strategy of building a network of Welsh medieval castles which would span across the North West coast of Wales. The Welsh Medieval Castles built by the English under the direction of King Edward I provided a power base for the Medieval Plantagenet King and ensured that the Welsh were subservient to the English. King Edward I was nicknamed "Longshanks" due to his great height and stature. This section tells the story of Edward I and the part he played in the building of the great Welsh Medieval castles. Prince Edward was the son of King Henry III. He was born June 17, 1239 and died July 7, 1307. In 1254 he married Eleanor of Castile (1244 - 1290) in Burgos in Castille in Spain ( the Land of Castles ) and the marriage brought him lands and titles. The marriage between Eleanor of Castile and Prince Edward was a marriage of convenience - Eleanor was only ten years old and Edward was fifteen years old. Their marriage was a political one. Eleanor's brother, Alphonso of Castile, was at war with King Henry III of England in a dispute over the French province of Gascony. King Henry III demanded Eleanor as a bride for Edward to forge an alliance between the two countries. The same year as his marriage to Eleanor Prince Edward became the Duke of Gascony. The young couple did not live together until Eleanor was in her late teens. The marriage of convenience turned into a marriage of love. This was the time of the Crusades and Eleanor accompanied Prince Edward to the Holy Land and the 1270–1272 Crusade. Edward arrived in Acre in May 1271 with 1,000 knights. It is said that she saved his life after he had been wounded. King Henry III died in 1274 and at the age of 35 years of age Prince Edward became King of England. Eleanor and Edward were both crowned in Westminster Abbey on the 19th of August 1274. King Edward was a veteran warrior and referred to as "the best lance in all the world". He was strong , brave, hot tempered and ambitious - he intended to increase his lands and power. King Edward was determined to enforce the claims of the English kings to their supremacy in the British Isles - including Scotland and Wales. At this time Wales consisted of several separate kingdoms. King Edward had an alliance with the leaders in South Wales but North Wales was a problem. Llywelyn ap Gruffyd, was Prince of Gwynedd in North Wales. 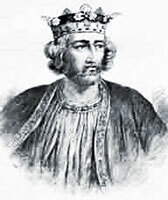 Welsh Battles with Edward's father had led to the Peace of Montgomery in 1267 in which Llywelyn ap Gruffyd was conferred the title as Prince of Wales. In return Llywelyn ap Gruffyd had agreed that he was subservient to the English King. However, Llywelyn reneged on the agreement. He refused to do homage to Edward and he did not attend Edward's coronation. In 1277 King Edward branded Llywelyn ap Gruffyd as "a rebel and disturber of the peace" and declared his lands forfeit. Edward I launched a massive invasion of Wales, re-conquering South Wales and defeating Llywelyn ap Gruffyd and North Wales. He was forced to accept the peace of Aberconwy 1278. Llywelyn ap Gruffyd could not accept defeat and in 1282 mounted a second Welsh rebellion with his brother David. Llywelyn ap Gruffyd was killed in battle and his brother David was captured and executed. Wales had been conquered by Edward I and became incorporated into England under the Statute of Rhuddlan ( also called the Statute of Wales ) in 1284. King Edward I was determined to to ensure his conquest of Wales and to to incorporate Wales with England. He knew that the Welsh would be difficult to subdue and that more Welsh rebellions were inevitable. He wanted to demonstrate the supremacy of the English and build power bases in Wales which would totally dominate the Welsh. The English King decided on a strategy of building elaborate fortresses and castles in Wales in order to crush and intimidate the Welsh population. His castle building strategy started in 1278, following the first Welsh rebellion. In 1278 Edward commissioned the building of four major castles in Wales - Flint, Rhuddlan, Builth and Aberystwyth. More medieval castles were built following the second rebellion of 1282 and the building of Caernarfon, Conwy, Harlech and Beaumaris castles were also commissioned. King Edward was correct in his view that the Welsh would be difficult to subdue. Less than 12 years after the Statute of Rhuddlan the Welsh mounted another rebellion. The Welsh rebellion of 1294 was led by Madog ap Llywelyn who over ran Caernarvon Castle. It was re-captured the next year. Not only did King Edward I build the Welsh Medieval castles he also integrated new townships at the same time. These fortified townships were based on the Burghs, or Burhs, of King Alfred the Great and the Bastides of Gascony. King Edward I was able to keep his tight reign over Wales due to his massive power bases provided by his Welsh Medieval Castles and his purpose-built Welsh Medieval Fortified Townships. The strategy of King Edward I to build medieval castles as his source of power in Wales proved to be highly successful. Towards the end of his reign the ever ambitious and hot-tempered King became increasingly involved in bringing Scotland under his direct rule in a similar manner to that which he had achieved in Wales giving him the title of 'The Hammer of the Scots'. In 1292 an English Baron called John Balliol was crowned King of Scotland at Scone. Balliol swore loyalty to Edward but Balliol formally renounced his homage to Edward in April 1296. Edward retaliated by invading and sacking Berwick. All of the citizens of Berwick were massacred. The Battle of Dunbar followed and Edinburgh Castle was captured. Balliol surrendered his realm and spent the rest of his life in exile. King Edward had the sacred Stone of Scone, also known as the Stone of Destiny, removed to London and subsequently placed in the Coronation Chair in Westminster Abbey ( it was not returned to Scotland until 1996). The Scottish subsequently rebelled and William Wallace ( now known as Braveheart ) led the Scots. William Wallace was defeated by King Edward at the battle of Falkirk in 1298. Wallace escaped but was captured in 1305 and executed. The Scots were still not subdued and in 1306 Robert the Bruce (1274-1329) rebelled and was crowned king of Scotland. King Edward was desperate to punish the Scots and led another army to Scotland. He died in en-route. The death of King Edward I at the age of 68 on July 7, 1307 was ironic. He died of dysentery at Burgh on the Sands near Carlisle. The King who followed the footsteps of the mighty King Alfred the Great in the building of fortified castles and towns (called Burghs) died at a place called Burgh. His legacy of the chain of coastal Welsh Medieval Castles will forever remain on the landscape of Wales. The building of the great Medieval Welsh castles were master-minded James of St George - the Architect of the Welsh Medieval Castles - follow the links to continue the story of the Welsh Medieval Castles of King Edward I.